From July 18-21 this year over 100 young people gathered at Mercy International Centre in Dublin for the Young Mercy Leaders Pilgrimage for secondary school students. The program on the last day of the pilgrimage gave the pilgrims time to develop an action plan to be put into place on their return to school. Students in Australia were involved in a winter sleep-out raising awareness by being in solidarity with the homeless and students in Cork participated in a walk for the Wellsprings Project for Homeless women. Mercy Day Masses throughout the world saw students share their learnings and reflections about Catherine’s life and work. Campaigns in schools to raise awareness of women who suffer from homelessness, poverty, unemployment and domestic violence. A challenge relating to this area of need which one student took on was to make her fellow students, and others, aware of the fact that many of these women don’t have the most basic of needs including sanitary items. She decided to pursue this aspect of poverty as it symbolised to her the works and inspirations that Catherine McAuley herself undertook in helping and providing for disadvantaged women. Students have devoted themselves to trying to be different in the sorts of conversations they engage in - moving away from the mediocre topics that often occupy their time to ‘hanging out’ with different friends and educating them on a fact per day about Catherine. 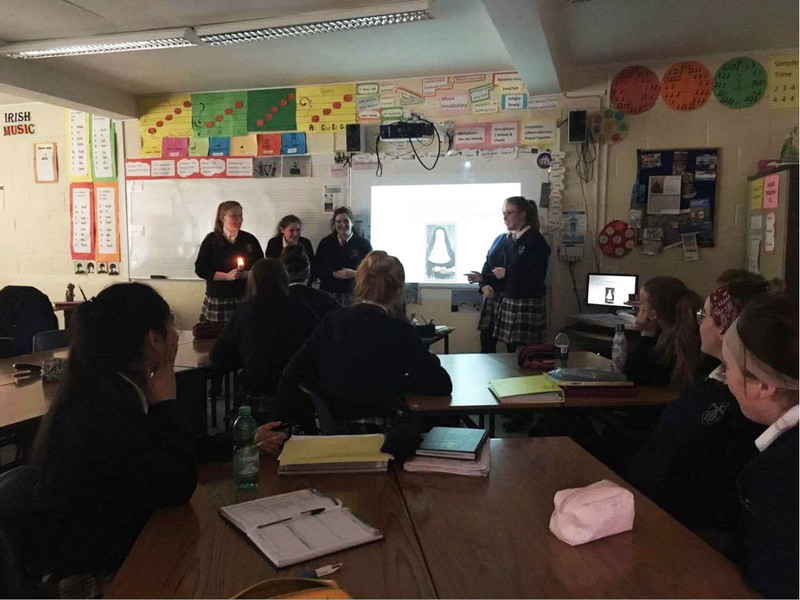 Some students identified their biggest achievement as being able to stand before their school and share the experience they had at MIC in July as well as taking the chance to unpack the core values of Catherine McAuley to share with students and teachers. Other students are in the planning stages of having the 16 days/16 stories campaign during the term. They are endeavouring to form links across multiple schools using the network they established with other Young Mercy Leaders whilst here in Dublin. Students are planning to send letters to companies that don't endorse fair trade in a hope to make a positive impact. On Mercy Day a stall promoting ethical brands and a test that showed how many slaves work for the non-ethical ones was run in one school. Young Mercy Leaders Clubs have been formed. Foundation Day celebrations will see some students take responsibility for prayer and a presentation about Catherine McAuley and the Sisters of Mercy. They will also prepare witness talks about their experience in Dublin. In another school plans are underway to hang a large map of the world in the hallway of the Administration wing that will be labelled with the names and locations of all Mercy High Schools around the world – these schools will then be invited to submit a short video that will link to the map. Many students have been given the opportunity to share the impact of the pilgrimage on their thinking and living with their peers, and some of the junior students in their schools. Some tried to portray Catherine’s personality and values, by sharing some of the wonderful stories they heard on the pilgrimage, others ran workshops on Catherine McAuley, Mindfulness, Human Trafficking and the ongoing work being done by Mercy International Association today. Some students have reported that they have been speaking at Board meetings, to those who had supported them financially to attend as well as school assemblies about what they gained from the Pilgrimage. Practical activities in one school saw the development of a friendship bench, a poster campaign and a tea morning for the school staff. The Mercy in Action Club at one school, that provides service opportunities for students, has doubled in number after the enthusiastic promoting by their Young Mercy Leaders. Last month the group made Halloween Bags with treats for younger children at a local school. One particularly encouraging outcome is that students in one school have already started fundraising to enable them to sponsor one or two students from a school/country that might not be able to afford to come for the Pilgrimage in 2019. Mercy International Association looks forward to hearing about further actions that have arisen from the experience of the secondary schools pilgrimage and to welcoming more Mercy secondary school students to the 5th biennial pilgrimage for secondary school students from Tuesday, 16 July to Friday, 19 July 2019. Please note change of date.